DOE-backed startup Skysun aims to do away with fiddly motors and support structures. Just when it looked like concentrated solar power (CSP) couldn’t get cheaper, a U.S.-based startup says it's found a way of cutting heliostat costs by a third. Skysun, of Bay Village, Ohio, is aiming to achieve the cost reduction by tying multiple heliostats -- the mirrors that reflect sunlight onto CSP power tower receivers -- onto a single motor and support structure. Currently, each heliostat on a power tower solar field has its own motor and support, significantly adding to the cost of what is essentially just a mirror. 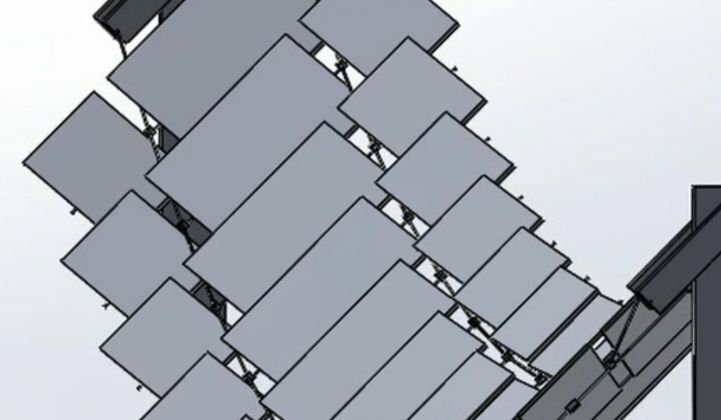 Sandia National Laboratories, which is collaborating with Skysun through a $275,000 Small Business Voucher provided by the Department of Energy, believes this ‘ganged heliostats’ design could cut average heliostat costs by 33 percent. “Sandia reported that Skysun’s ganged heliostats can achieve an average price point around $80 per square meter,” according to the DOE. That compares to an industry average of $120 per square meter and is close to the DOE’s SunShot Initiative goal of lowering the cost of solar collectors to $75 per square meter. It is far from the first time ganged heliostats have been proposed, though; one of the first mentions of the technology is in a 1978 patent. And in 2010, a team from the Masdar Institute of Science and Technology in Abu Dhabi, United Arab Emirates studied the efficiency of ganged heliostats in a 100-kilowatt pilot plant. Skysun’s breakthrough, detailed in a study by founder Jim Clair, appears to be the use of tensile support structures that work with single-axis instead of dual-axis actuators. The system is said to maintain industry-standard accuracy in winds of up to 20 miles per hour. 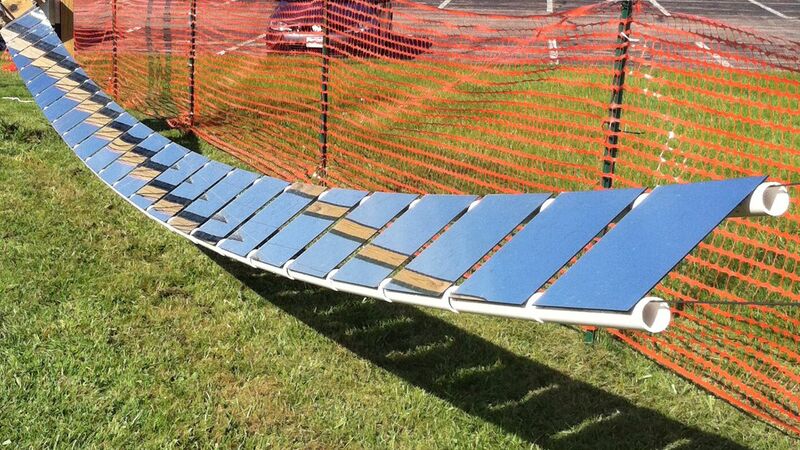 Slashing heliostat costs could be a big deal for CSP developers. In its 2016 Power to Change report, the International Renewable Energy Agency estimated that the solar field accounted for 38 percent of the total installed cost of a power tower CSP plant. Cutting that cost by a third would reduce overall installed costs by around 13 percent. That said, it is unclear how easy it will be for Skysun’s ganged heliostats to achieve commercialization. After years of attrition from low-cost PV competitors, the CSP market today is populated by just a handful of names, most of which have hard-earned project development credentials. The number of projects on offer in the sector is miniscule compared to what is going on in PV or wind. In short, the CSP market is not one that favors wild experimentation right now, even though players are said to have an appetite for risk. It also needs to achieve cost reductions as great, or greater, than other renewable sectors in order to be competitive. Another relevant factor is that CSP of late appears to have been achieving substantial cost reductions without having to resort to radical design changes. In September, for example, developer ACWA Power bagged a 700-megawatt CSP project in Dubai for an eyebrow-raising $73 per megawatt-hour. SolarReserve managed to get down to $63 per megawatt-hour in March with a 450-megawatt project in Chile. And in August, the U.S. developer went even lower with a project in Australia, bidding $60 per megawatt-hour on a 150-megawatt plant. That's cheaper than the offshore wind projects that have put the gas and nuclear industries on guard in the U.K., without even accounting for the fact that the CSP plants come with several hours of storage. These cost reductions have led some observers to predict an upswing in fortunes for an industry that has thus far lagged in adoption behind PV and wind. “This is an industry that is booming,” said economic consultant Jonathan Walters. “For me the bottom line is that CSP is becoming competitive with gas-fired power, which will make it far more game-changing than any other renewable energy technology is likely to be," he said.